This is another unswatched blind purchase. Wonderland was considered at first since it seemed my kind of bright pink being significantly cool-toned. Then, I remembered these hybrid colors with stain do deepen once applied on lips. I wanted something intense but not so intense that it would end up looking red on me. In my view, Vertigo and Wonderland are in the same color family. However, Vertigo is lighter and somewhat muted compared to Wonderland which has more of a pure color intensity. Vertigo is a retro color if you ask me. For some reason, it reminds me of the classic Revlon shade Cherries in the snow. 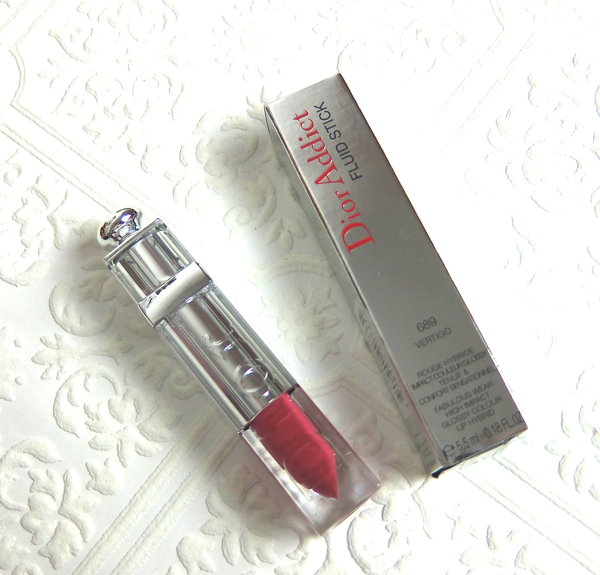 It is a reddish pink with some white thrown in, which would have made it almost unwearable for me if not for the particular finish of Dior Fluid Stick. I am extremely happy with my color choice. Vertigo turned out to be the exact thing I wanted - a vibrant color that instantly brightens up my complexion while looking lighthearted. Maybe I lucked out with the color choice, or maybe I've gotten quite good with blind shopping over the years in which case I should feel a little proud. 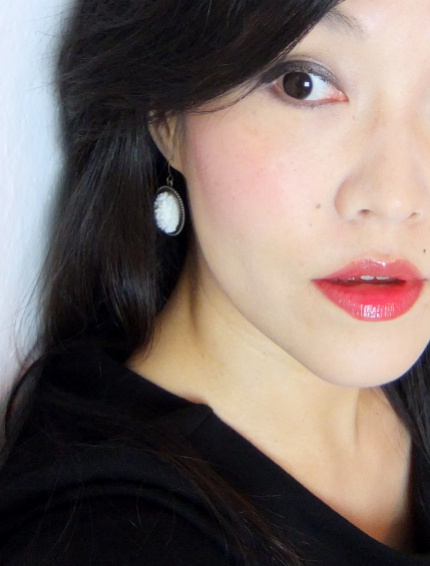 Here are a couple of pics of me wearing Dior Addict Fluid Stick Vertigo. 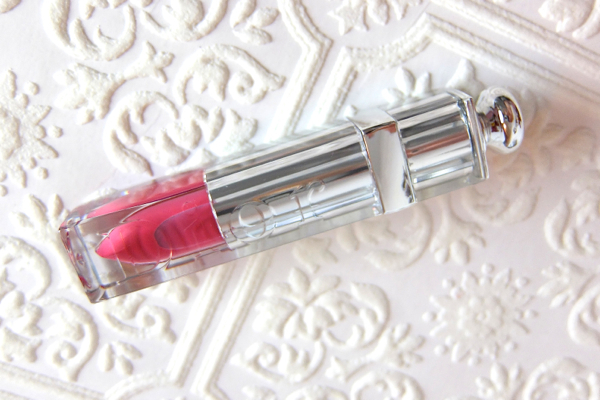 Have you tried Dior Addict Fluid Sticks? Really pretty! Glad you like them so much! I wish I did lol! 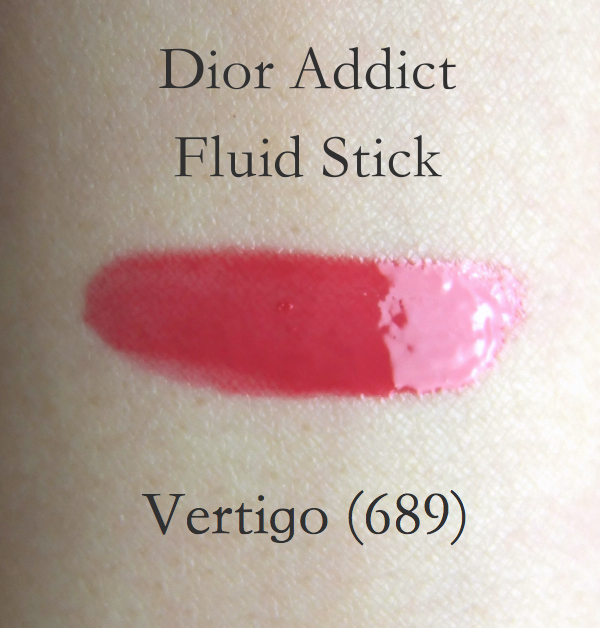 i was wondering why they called it a fluid stick because the packaging looks like a lipstick, lol. but i see that it has a wand inside! pretty color. I love shades like this one! Looks beautiful on you! I need to check these out - I'm into this whole liquid lipstick trend that's been going around. I am all about these hybrid lippies. This one is quite nice if you're looking for a intense color that are attention-grabbing. OH dear, this product has been popping up everywhere and I can feel my discipline/resistance crumbling! It looks lovely on you This colour looks very very nice and it looks like the quality is really up there! Definitely another very pretty shade! I've got a lot of highend bits on hold right now simply because of how much they cost over here! However having bought the nyx butter glosses I think I may have found a gloss that not only is tacky enough to stay without the lipline without any bleeding but they so moist that my always peely lips don't peel! I'm quite impressed that only so little transfer occurred, that's impressive! I've heard lots of good things about the NYX butter glosses myself! Keep forgetting to try some of them. Hey Lena, great pick! This definitely packs a bit more punch, but isn't a color that's way too bright on its own! I have three of these so far, and I'm trying hard not to buy any more of them soon! sooo pretty! I really like the colour, but can't justify it because I have other products that are so similar. In regards to blind shopping... I WOULD NEVER! But I do... haha. I'm happy when it turns out alright but if it doesn't work out then I beat myself up. Thank goodness for awesome return policies! Such a pretty colour on you and the formula looks fantastic! It fades away very naturally, too. Goodness me, this colour looks so beautiful on you! 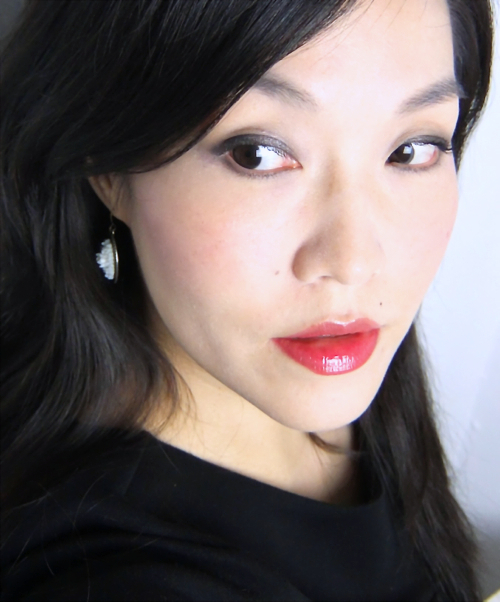 I haven't tried any of Dior's lip products but they are on my to-buy list! I'm really liking this shade but I'm not sure how well it'll go with my complexion. LOL going to the actual counter to try might trigger a purchase, so I'm not sure if that'll be a good idea! This is very pretty on you ! You should try Magique ! It's brighter than Wonderland. I looove it ! The colour is gorgeous! It doesn't transfer that badly... sure the colour on your upper lip is almost gone but at least it doesn't come off in patches? Sweetie, what is the wear time like? So pretty on you, Lena! I just swatched these for the first time yesterday, and they're all so pretty! Not sure if I'll be getting one anytime soon, so I'll just continue living vicariously through others :) I feel the same way about the blind shopping thing! I'm quite good at it as well, which is nice since I have a strong distaste for most SAs at the counters. If you don't like tacky lippies, maybe the Lip Lover is a much better option. Oh wow, love this color. You have so many pretty lipsticks! It is a complex color if you ask me. I call it an edgy pink or an easy red. I think you have convinced me to invest in these lol. They wear so pretty on you! And the formula sounds amazing!